I was trying to clean up my sewing space, ya know, so I could get to my sewing machine again ;-) I've had some Pezzy Print scraps sitting around since I made my flying geese mini. I've needed a hard clean for awhile. In any case, I whipped them up into this cutie pin cushion. I know what you're thinking. That looks like procrastination sewing. Well, you're right. I dunno, this just needed to be made before any legitimate sewing. It did let me clean up my pins. That's something, right? I sewed a bit of giant gold ric rack in the middle, because I like a good handle on a pin cushion. I wish I'd worked one into my giant cupcake pin cushion. From now on, I'll make them all with handles. I thought it needed to be squished in the middle like a doughnut, so I used a button and a giant scary upholstery needle to sew the top tightly to the bottom with some hand quilting thread. I broke the thread once. I probably should have used button thread, but I doubled up the strands and got it to hold. This was a super fun instant gratification project. Don't you love those? I'm dying to make a pin cushion from Penny's tutorial, though. A gal can never have too many pin cushions, right? 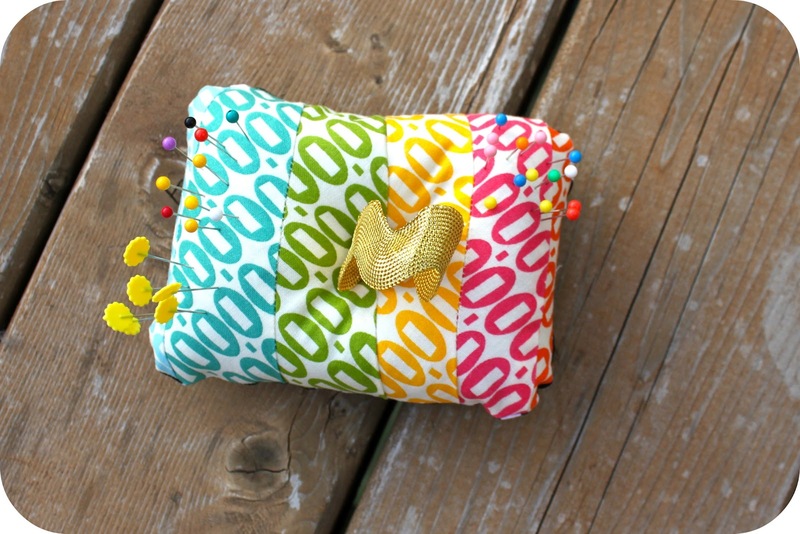 Here's to a little instant gratification in your sewing as well! I'm linking up with Somewhat Simple and Wild West Thursday. Glad you commented on my blog so I could find you! Always looking for new ideas for sewing! Cute pin cushion. I have a Hello Kitty pin cushion a friend made for me before I ever started sewing and now that I'm quilting I finally have a use for it. Now I want to make one for myself. That pincushion is too cute! I love those pezzy prints!